Since we are a brick and mortar shop, it is impossible to carry every chart, canvas, fiber, thread and fabric - but we try! We also feature a wide variety of treasures on our website, but just can't put every item on-line! 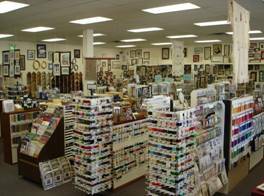 So click on the list below to go directly to many of the websites of cross stitch & needlepoint designers, manufacturers and distributors, as well as, check out the fantastic world of fibers and threads. We'll be happy to assist you in acquiring any of these products. Please let us know what you have found!